The mission of the Friends of Peace Memorial Auditorium is to help raise funds to renovate Peace Memorial Auditorium so the memorial may continue to honor the 101 Riley County World War II veterans and the county's veterans of previous wars who paid the ultimate sacrifice, and to serve the community's many needs, including the arts, athletics, and civic events into the future. Click on the "Peace Memorial Auditorium History" tab to view the document. Vintage postcard, distributed by P-K News Co., Junction City, KS. The ribbon was cut, the memorial auditorium was rededicated, and the space is now open and ready to host community events! 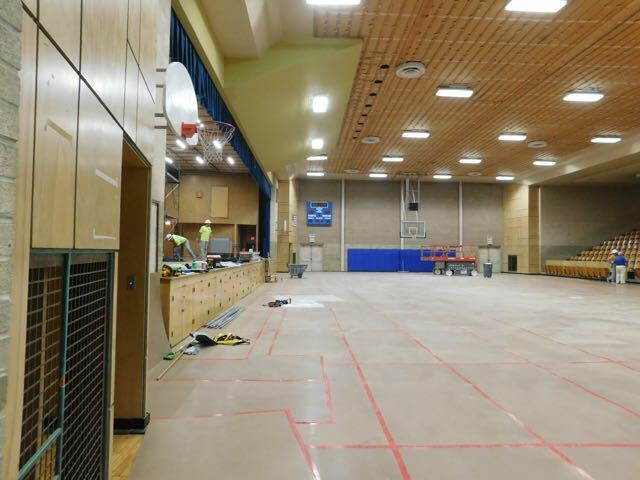 Peace Memorial Auditorium will be closed for the summer while renovations, which have been almost five years in the making, are underway! An electronic, interactive kiosk in the veterans' memorial foyer -- which provides information about the history of Peace Memorial Auditorium, information about other memorials in Riley County, information about the 101 Riley Countians who were killed in World War II, and other related information -- is now operational! Stop by the foyer to check it out! The information on the kiosk also has a web version. Click the button below to visit the companion website. The Friends of Peace Memorial Auditorium (FPMA) is sending out a call to veterans and families of all Riley County veterans who served in World War II for any material related to local veterans. 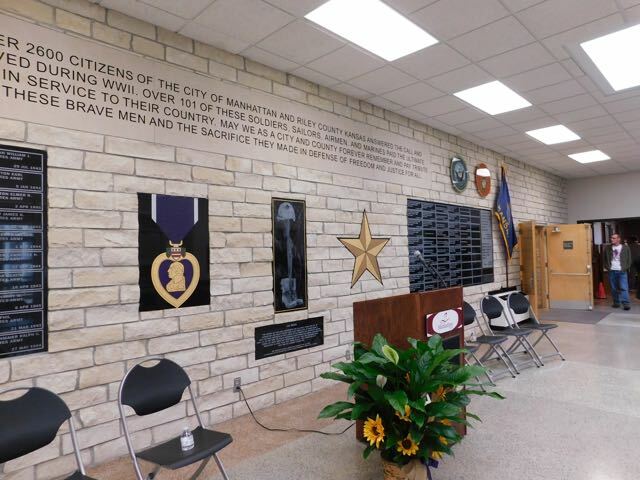 FPMA is working in partnership with the Riley County Historical Society and the Chapman Center for Rural Studies at Kansas State University to place an interactive kiosk in Peace Memorial Auditorium to tell the stories of our local veterans. If you have information or materials to share, visit the link below. Peace Memorial Auditorium was built as a "living" memorial to the 2,610 Riley County men and women who served in World War II. Saturday, Sept. 26, 2015, 4:00 p.m. Dedicated on Sept. 26, 1955, Peace Memorial Auditorium is celebrating 60 years of service to the community! 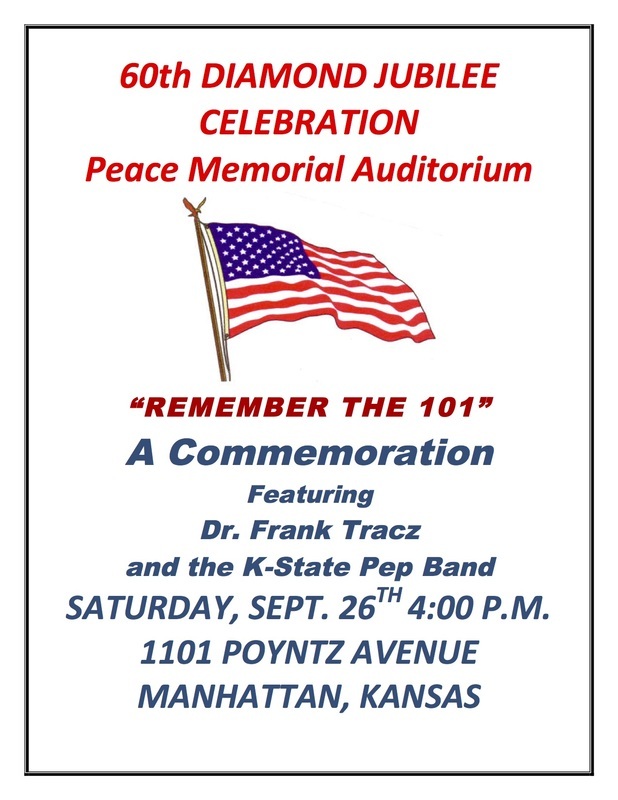 A program was held on Saturday, Sept. 26, with special guests Dr. Frank Tracz and the Kansas State University pep band as well as other musical performances. The program also included biographies of a few of the 101 Riley County servicemen killed in World War II and honored by the memorial auditorium.